If you’ve discovered that the gluten-like protein avenin in oatmeal aggravates your Celiac symptoms, then teff is a good choice for a switch. Toasted teff porridge as described in the recipe below, enhances the natural nutty flavor and is my personal favorite method. If you have a particularly sensitive stomach, I would suggest soaking it overnight first. This will enhance digestibility a bit, although teff is not particularly high in anti-nutrients when compared to other cereal grains. When soaking teff before cooking, follow the method below. Place 1 cup dry teff grain, 3 cups filtered water, and a bit of sea salt in a pot, mix well and cover. Let sit overnight. In the morning, add optional 1/4 teaspoon cloves and cook for about 10 minutes until the water is absorbed and the porridge is of desired consistency. As you can see from the picture, cooked teff looks very similar to Cream of Wheat, just a darker color. Serve with your favorite whole sweetener (I prefer seasonal raw honey) and/or fruits and nuts of choice. I have just finished a bowl of teff porridge as I type this. It makes a great afternoon snack as well as hot breakfast. 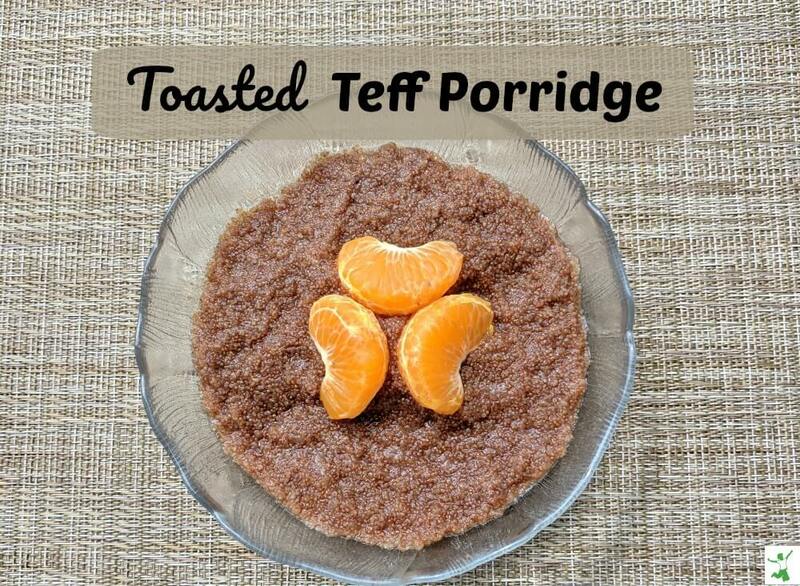 Already love teff porridge? Another similar tasting, gluten free option is amaranth porridge. Amaranth is a slightly nutty tasting cereal grain similar in flavor to teff that also offers an excellent protein profile. Buckwheat or quinoa porridge are other Celiac safe alternatives that are a bit milder in flavor. Classical recipe for teff porridge best enjoyed for breakfast hot in a bowl with your choice of healthy fat, whole sweetener and nuts or fruit topping. Heat a large saucepan over medium heat, add sprouted (or unsprouted) teff grains and toast, stirring frequently until the grains begin to pop which takes just a few minutes. Add the water, sea salt, butter and optional cloves. Bring to a boil, cover and cook for 8-10 minutes stirring occasionally. Remove promptly from the heat at 10 minutes even if it looks like it should cook a bit longer. The porridge firms up a lot when it cools slightly. Serve warm with choice of healthy fat and whole sweetener or fruit of choice.